DYCONEX, an MST company, offers the smallest form factor, miniaturized NFC (Near Field Communication) tags for a variety of sensor applications in harsh environments. The tags include sensors, microprocessors, and batteries that can be built using Liquid Crystal Polymer (LCP), a high-performance thermoplastic polymer, both used as the substrate and encapsulation material. 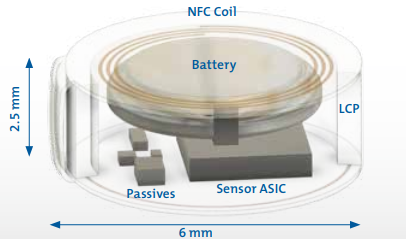 These NFC modules feature diameters as small as 6 mm and are still readable with standard NFC tag readers. The encapsulation with LCP provides good protection against chemically aggressive environments, such as acids, and salty water at minimal wall thicknesses. At the same time LCP is transparent to electromagnetic fields providing excellent readability for standard RFID tag readers.